Multnomah Falls tumbles 611' from Larch Mountain to the Columbia River. This iconic waterfall is the most visited outdoor recreation site in the Pacific Northwest, with over 2 million people stopping by each year to see the spectacle. Multnomah Falls is often credited with being the second tallest year-round waterfall in the US, but this status is now disputed by numerous record keepers. No matter its true rank (and however determined), it's certainly one of the most recognized and deservingly popular attractions in the Gorge. Visitors can see most of Multnomah from the main plaza, which includes the upper 542' tier, Benson Bridge and lower 69' tier. The Larch Mountain Trail leads to view points above Multnomah, and on to several other waterfalls and connections for trips of varying length and difficulty. The loop begins at Multnomah Falls Plaza with postcard-like views of the falls. At least 5 distinct basalt flows can be counted in the gorge wall from this point. A paved path climbs .2 miles to Benson Bridge, which spans the two tiers. Steep, paved switchbacks continue through diverse forests and moss-covered basalt cobble to a spur for Multnomah Overlook (1.1 miles : 760'), a short excursion to the falls' precipice. The main trail transitions from pavement to dirt and dips across a bridge into a Jurassic-like forest to Dutchman Tunnel, a natural overhang carved from lava. 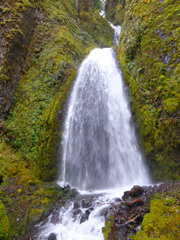 It moderates up Multnomah Creek to Dutchman Falls, Weisendanger Falls and Ecola Falls with great photo opps for each. Weisendanger is most accessible with a short scramble down to the creek bed, then up to the base of the falls. You'll pass over the top of Ecola Falls before reaching the Larch Mountain Trail - Wahkeena Trail split (1.7 miles : 1,175'). Follow signs right (clockwise for Wahkeena). The Wahkeena Trail (#420) rises out of the riparian corridor into a tall, drier forest. It moderates on a duff-packed path to consecutive connections for Devils Rest and Trail #419C (2.55 miles : 1,572'); keep straight at both. 419C is a fine option for continuing the loop, but most find the Wahkeena Trail more attractive and better maintained. The Wahkeena Trail drops to the Angels Rest split (2.97 miles : 1,310'); keep right and begin a sharp descent beside a kinetic stream to Fairy Falls (3.45 miles : 910'). Fairy Falls is a classc fan fall which drops about 20' over moss-covered rocks. The trail crosses the narrow gulch twice on bridges before opening to the spur for Lemmon's View Point (3.8 miles : 643'), a nice step-out with views across the river. Here it transitions back to pavement and winds down to Wahkeena Falls (4.25 miles : 246'), which slides through a voluminous chute carved in a broad, basalt cliff face. The trail drops to Wahkeena Trailhead on the Historic Highway (4.5 miles : 110'), where you'll follow signs for the Gorge Trail / Return Trail to Multnomah Falls to complete the loop (5.1 miles). While it's possible to walk the road back to Multnomah, car traffic is usually heavy - use the designated trail. Multnomah Falls is the most visited outdoor recreation site in the Pacific Northwest, with over 2 million people each year. Arrive early to secure parking. An overnight fee is required (see rules and regulations). Campfires - Mark O. Hatfield Wilderness: Campfires are not permitted June 1 - September 15 (peak season) along the Eagle Creek Trail from the wilderness boundary to the Eagle-Tanner Trail. Fires are permitted from September 16 - May 31 unless otherwise posted. No fee or recreation pass is required to access Multnomah Falls or Wahkeena Falls. "Beautiful loop but it's getting awfully slick - especially on the switchbacks beside Multnomah. It's probably better to go clockwise as this description suggests to avoid coming down and having to slalom through throngs of people on really slick tread. Fairy Falls, though smaller than the main attractions on this trail, is the prettiest and photographs really well with high water volume and gray/dim light." "The falls are a relative trickle right now but the hike itself is really nice. I can see the paved walkway up Multnomah being tricky when wet - it's steeper than I expected too." "The paved trail above Multnomah Falls is getting really slick. We came early in the morning and there was a very thin layer of black ice. We turned back at Ecola Falls because we didn't want to push our luck. The way up was okay, but the way down was very slippery and poles didn't really help. You really have to be careful with children. "